This extra special badge has been patiently waiting for its turn to be unlocked, and now we’re very excited to tell you how you can do it! 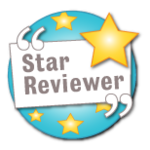 It doesn’t matter how many books you’ve read; Star Reviewer is about quality, not quantity. When you add a book to your profile, take a moment to leave a review and let other readers know what you thought. If you write book reviews that are interesting and informative, you could find yourself being awarded the Star Reviewer badge. The badge will show up on your profile and next to your username in Chat and on book pages. Maybe it was a funny story that made you laugh, or a touching story that really made you think. If you didn’t enjoy a book, that’s good to know too! You might wish the author had done something differently, or maybe you found a character too annoying to stick with. Would you recommend the book to other readers? Tell us who! And of course, be careful not to give away any big plot spoilers! Let everyone know what makes your book a must-read! You don’t have to write a big long essay, just tell us what you think! Have a think about what makes you choose one book over another – what would you like to know before you start reading? Ready to write a review? Search for your book, give it a rating, then you’re ready to review! The Summer Reading Challenge team read all the book reviews before they’re published, so there may be a delay before you see it online. Don’t worry, it will show up! What do you think makes a brilliant book review? Let us know in Chat!